There’s a story, an angle to the Newport Jazz Festival this year, other than the long-running narrative about it being an enduring institution of jazz and, by extension, a pearl of American culture. Twenty-seventeen marks the first edition under the artistic directorship of bassist, composer and broadcaster Christian McBride, alongside the festival’s feted co-founder George Wein. What does that mean to Newport’s veteran festivalgoers? On the surface, not a whole lot. McBride has inherited a well-oiled machine that sounds crisp and tends to run like clockwork. On Friday, you could feel his presence in bookings like James Brown alum Maceo Parker, leading a lived-in and locked-down band on the main stage, and Christian Sands, the piano phenom who raised his profile performing in McBride’s groups. But then again, Maceo could have filled the need for a mid-afternoon crossover act just as easily in years past, and Sands is precisely the brand of rising talent that could comfortably work the smaller Harbor Stage, no nepotism required. The same goes for McBride’s Philly pal Joey DeFrancesco, the Hammond virtuoso who closed out the Quad Stage with the hardest core of soul-jazz and postbop. Newport trades in consistency and versatility, and Friday’s lineup delivered. Trumpeter Amir Elsaffar’s Rivers of Sound Orchestra held much appeal for fans of ’70s spiritual jazz, but evoked that sound on deeper cultural and intellectual terms. Pianist Vijay Iyer and trumpeter Wadada Leo Smith’s otherworldly duo moved from futuristic soundscapes to stark melody to AACM-style sparring. Cécile McLorin Salvant somehow generated the intimacy of her club sets on the massive Fort main stage. Pianist George Burton put his unique composing, at once melancholy and full of momentum, across with the help of a terrific frontline featuring trumpeter Jason Palmer and saxophonist Tim Warfield. The straight-ahead sextet One for All brought to life a very satisfying set of mainstream jazz radio, receiving an explosive audience response. The Rodriguez Brothers repped forward-looking Latin-jazz to a similarly enthusiastic reception. 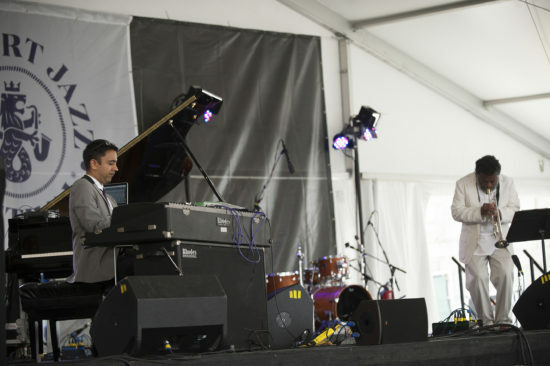 Jimmy Greene’s quartet, bolstered by super-pianist Kevin Hays, performed a wide-ranging set, with burners and ballads and a funky closer, “Thirty-Two,” that steadily, stealthily gathered form and steam toward a heady home stretch. A full-length Friday schedule at the fort is a relatively recent addition to the program, and has acted as a kind of soft opening for the event. Good weather helped to yield a healthy turnout, as did a strong showing of acts with jazz-adjacent appeal—Maceo, the a cappella group Naturally 7; Béla Fleck’s original Flecktones lineup. Leslie Odom Jr., the 35-year-old singer and veteran of the blockbuster musical Hamilton, was something to write home about, especially if you’re into pop-culture soothsaying. There was a lot of still-cresting star power on display, and not in a cloying way. Odom was a charmer, a self-deprecating performer whose voice tends toward a feathery, expressive, high R&B croon. Fronting a smart and powerful band filled out with jazz players like bassist Orlando le Fleming, he deployed his ace in the hole at set’s end: the rare opportunity to hear the songs of an impossibly in-demand Broadway show performed by an original cast member. (He joked about that fact, in a meta sort of way.) Expect a full-festival-circuit takeover.